Since our non-profit was created in the late 1990’s, we have been focused on increasing communication between the resource management agencies and the general public. 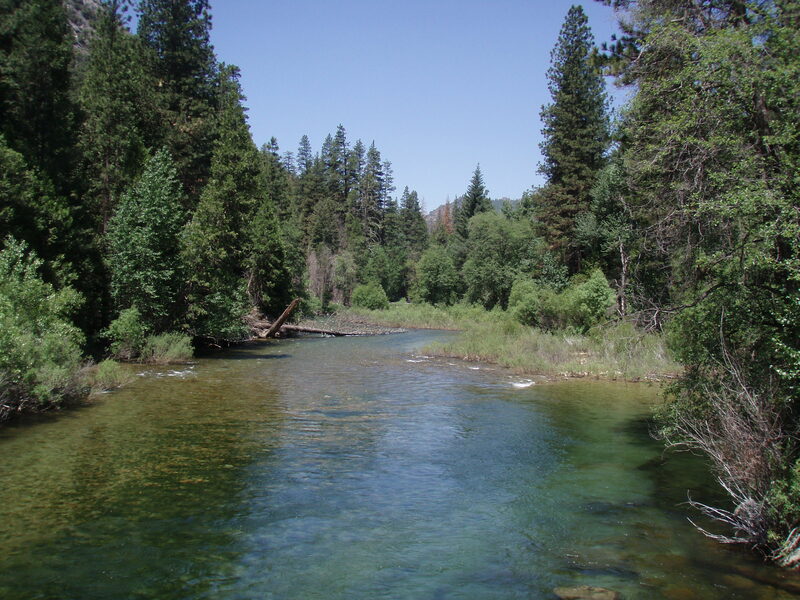 As visitors to the area for decades, our members were concerned about the impacts of development, prescribed burning, lack of erosion control, and other issues that could impact the quality of water and the wild trout fisheries in the South Fork Kings River. Some of our initial efforts included establishment of a website for the purpose of sharing information from the local, state and federal agencies tasked with managing the natural resources in Kings Canyon. … where we have been focusing our interests on what land use activities might be causing the massive algal blooms that we witnessed in the early spring and the other water quality related issues that we had been noticing (like phosphate pillows, normally related to soap suds from baths, waste water, and clothes washer draining, which believe it or not, we actually found happening within the Kings Canyon National Park near Cedar Grove). 2) established a baseline of water quality data, monitoring “Vital Statistics” (DO, pH, conductivity, and temperature) monthly from April until November. 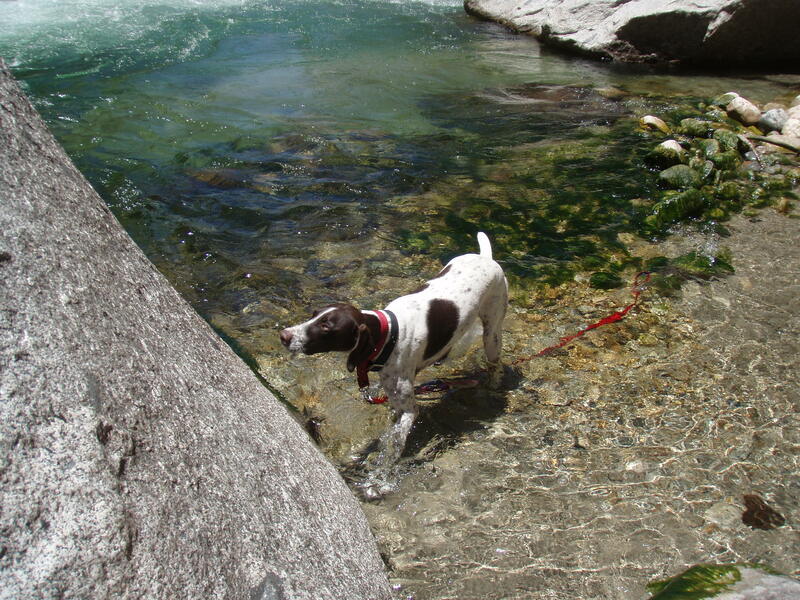 We also sampled for nutrients in the South Fork of the Kings River through an effort with the existing study of high elevation lakes being done then by the U.S. Geological Survey. 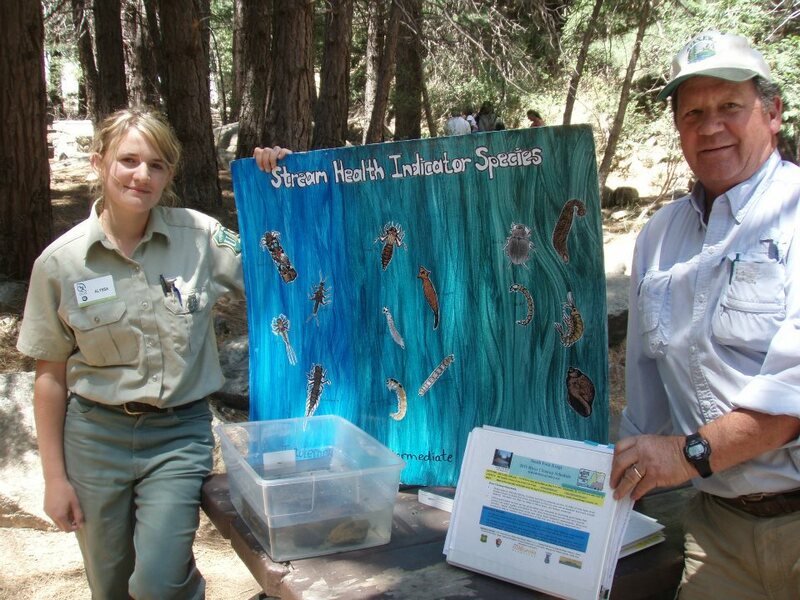 In response to our interest in the algal blooms and the phosphate pillows we had noticed, we coordinated our first “Citizens Monitoring Workshop” led by Dominic Gregorio, State Water Resources Citizen Monitoring Program Coordinator”. * In 2001 we coordinated our second “Citizens Monitoring Workshop” led by Dominic Gregorio, State Water Resources Citizen Monitoring Program Coordinator”. 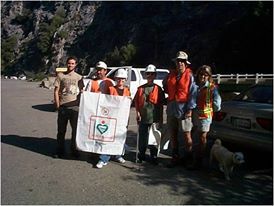 * In 2003, we initiated our first “River Clean Ups” working with the managers of Boyden Cavern who had already “Adopted” the Highway through Cal Trans. We have have increased the number and frequency of clean ups annually since then. We established volunteer agreements that are are updated annually, with the National Park Service and the U.S. Forest Service. We initially teamed up with the “National River Clean Up” program. 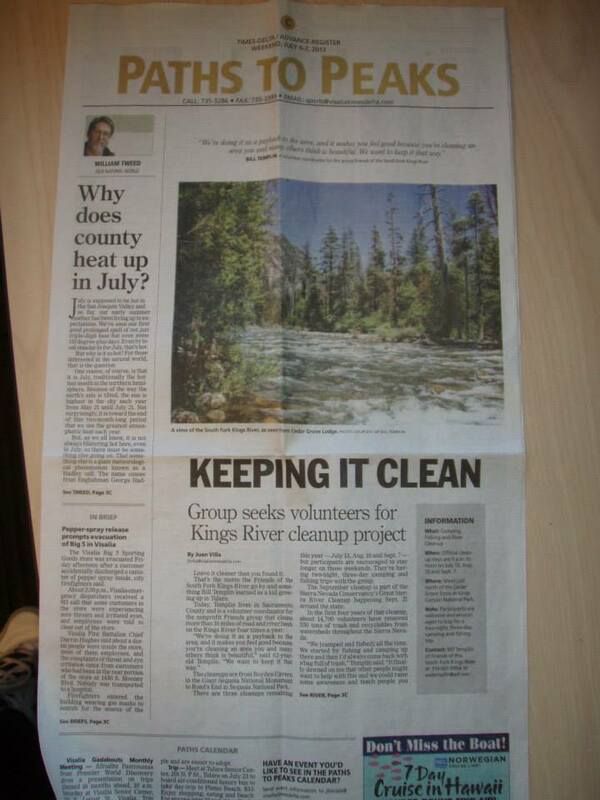 Notices about our clean ups began appearing in the quarterly Sequoia Kings Canyon National Park newspaper, “The Sequoia Bark”. 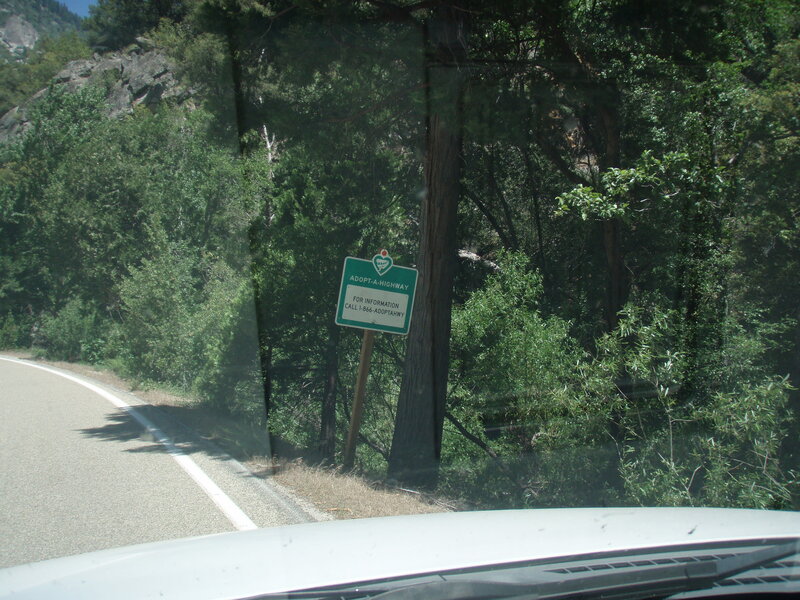 * In 2005, we “Adopted” the Deer Cove Creek Trail with the U.S. Forest Service, and have done periodic trail maintenance on this trail in Kings Canyon. 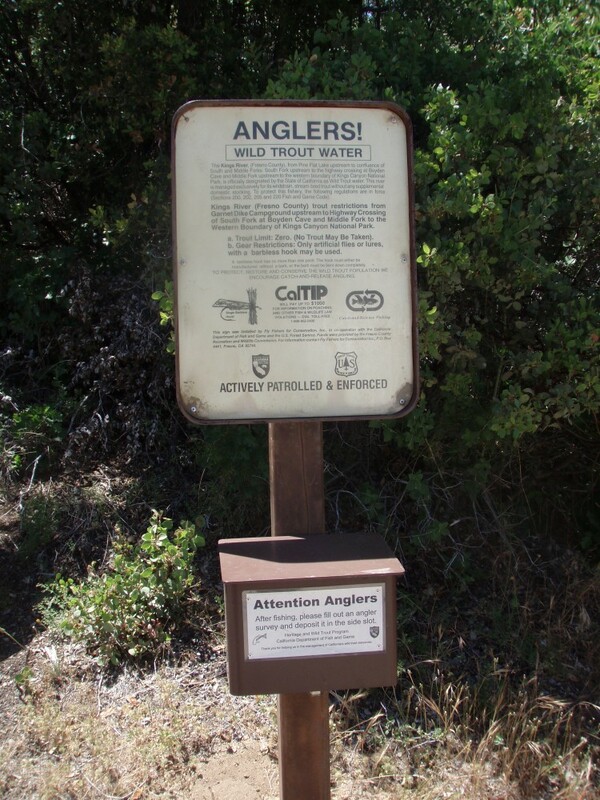 * In 2006, we began volunteering with the California Department of Fish and Game (now called “Fish and Wildlife”) to gather “Angler Surveys” from fly fishermen at their survey box at “Roads End” near Copper Creek. 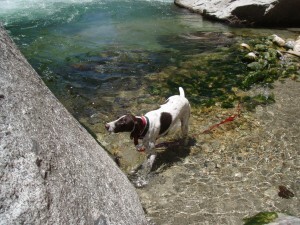 * In 2007, we began coordinating with the new state agency, the Sierra Nevada Conservancy, on their “Great Sierra River Clean Ups” held every September, and also began working closely with “Keep California Beautiful”. 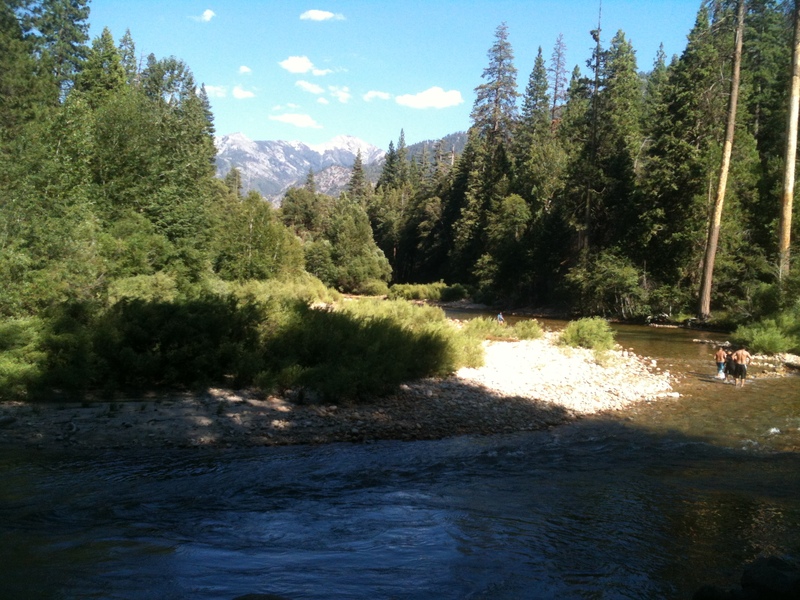 * In 2010, we began using the social media, Facebook, to share our activities and the results of our “Photo Monitoring” of Kings Canyon. * In 2011, our efforts to convince DFG to expand the Angler Survey Boxes were rewarded with new Angler Survey Boxes being installed at Grizzly Falls and at Yucca Point to get a better understanding of the success rates of all anglers (not just fly fishermen) within the South Fork of the Kings River. 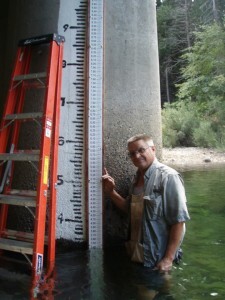 * In 2012, our relationship with the Sequoia Kings Canyon National Parks improved as we repainted the old “Staff Gage” on the bridge pier and then installed “USGS style” ceramic profession stage staff plate gages along side of the painted on staff gage. * In 2013, we “Adopted” Highway 180 from Yucca Point to the Park Boundary, through Cal Trans, after the Boyden Cavern folks made it available for us. 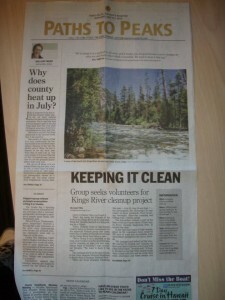 This year the Naval Air Station at Lemoore, CA began sending up staff to help with our clean ups, and we received our first articles published in the Visalia Times Delta and on the website of the Sequoia Riverlands Trust.